Removable Tattoos - Halloween Fun for Kids, Teens and Adults! 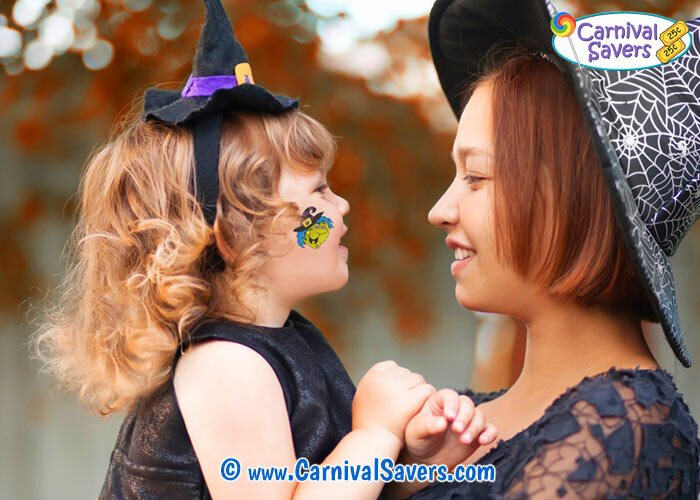 Halloween FACE PAINTING - Temporary Tattoos! "Washable" Tattoos Apply in Seconds & Cost Pennies! 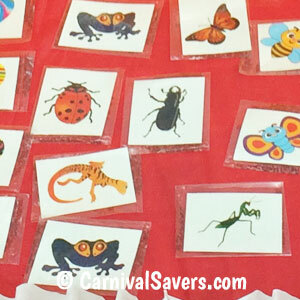 Before your festival, organize washable tattoos a container or envelope and set up your "Tattoo Example Board" or a "Face Paint Example Board" so children know what designs they can choose. To apply the removable tattoos, you really only need about half of one baby wipe, so using scissors, cut the baby wipes in half and place back into the plastic container. Next, add extra water to your unscented baby wipes - possibly a 1/2 cup or more right into the container - about as much as it will hold! Cover your table with a tablecloth (waterproof is best) and add the ticket box, booth sign and have chairs ready for volunteers and children. 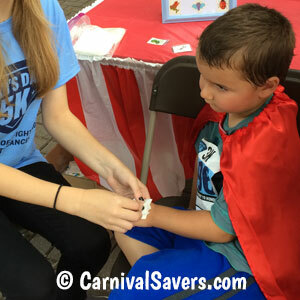 Children pay ticket to have volunteers add a washable decoration to their cheek, arm or back of hand. 2. Peel off the clear protecting cover from the tattoo. 3. Place the tattoo (decoration side down) on the child's skin. 4. Take a wet baby wipe and gently press on the back of the tattoo for 30 - 45 seconds completely soaking the backing paper. 5. Slowly peel up one edge of the tattoo making sure it has adhered to the skin. You are done with your fast, easy face painting! Our temporary tattoos work great - so great in fact, once they are dry, they will stay on the skin even in water stay until they slowly "wear off "the skin in about 5 days! Well, that is fantastic except if Mom wants to take a family picture and Jr. has a big bug removable tattoo on his cheek! The easy trick to removing Kids Temporary Tattoos is to use ordinary household tape - like the kind you use to wrap presents! Take a 2 inch piece of tape and stick it on the tattoo and pull the tape off - VOILA - the tattoo sticks to the tape and comes off of the skin with soap and no scrubbing! Note: If it is NOT windy or breezy on the day of your Halloween Evening Event, go ahead and lay out some tattoos on the table and let the children choose their designs and hand to the volunteers! AWESOME SUPPLIES for HALLOWEEN FACE PAINTING!